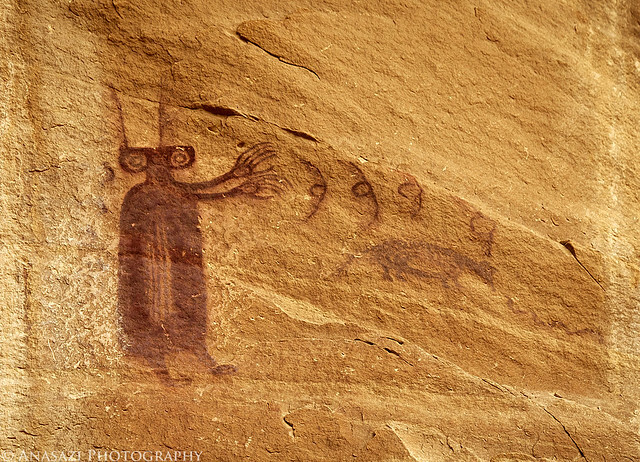 Originally this hiking trip in the San Rafael Swell was put together to so that I could meet up with my friend Philippe while he was out on a long trip to the Southwest, but it ended up being a very memorable and unique experience for me. I usually try to do a little research and planning when I am going to be exploring a new area, but other than knowing the general area we would be in, I left all the planning up to Philippe. On top of that, I knew we would be making a loop out of the hike, but I didn’t even know how long it would be. It turns out that we hiked about 12.5 miles round trip. Luckily, everything worked out great in the end! 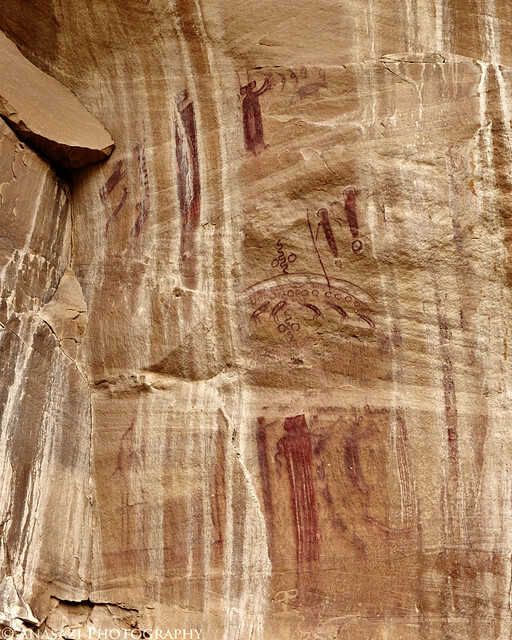 Our goal for the day was to find and visit four different rock art sites along the way, but unfortunately we only found one of those four. 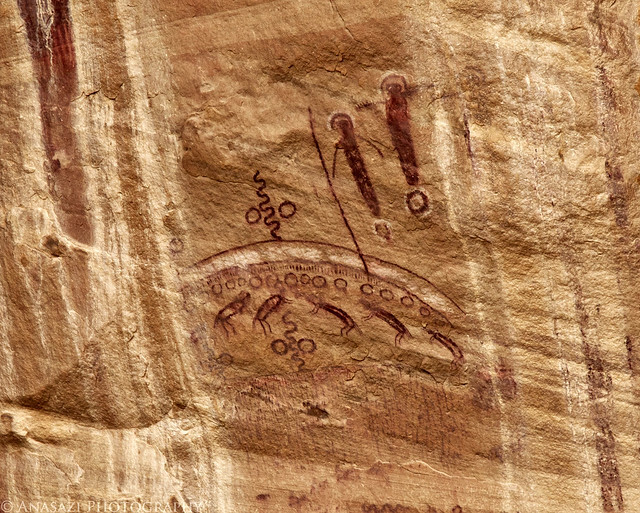 However, we did end up stumbling upon a new Barrier Canyon Style pictograph site that we were not expecting, which was very exciting! Our first visit was to the Sunlight & Shadow Panel. This is a very unique Barrier Canyon Style Panel located high up on the canyon wall at the top of a very steep and loose talus pile. 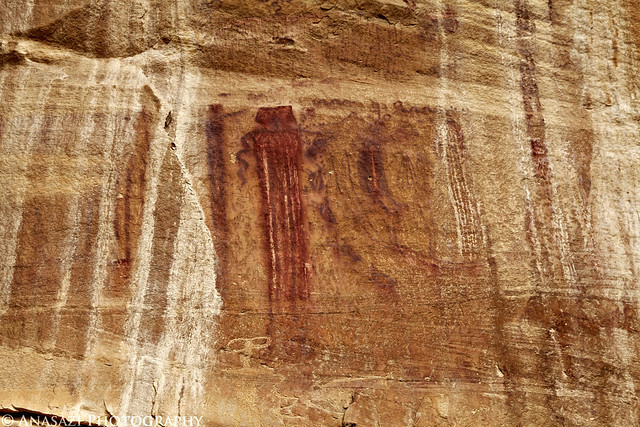 We climbed up and spent some time photographing the pictographs here. The day was overcast, so we did not have any issues with one of the panels being in the sun while the other is in the shadow. Here’s a view of the full Sunlight & Shadow Panel. After visiting the Sunlight & Shadow Panel we went on and searched for the next three panels. Unfortunately, we had no luck finding any of them, and I believe that we were completely in the wrong location to find them. I’ll have to return to the area when it cools off a bit and continue the search where I think they might be. After searching the canyon walls, climbing up and down steep talus slopes in search of the panels we were both getting a little frustrated and tired…plus the on and off rain showers didn’t help any. Before heading back towards our vehicles, we decided to head down-canyon a little ways just to see how far we could go before it got too technical for us to continue. 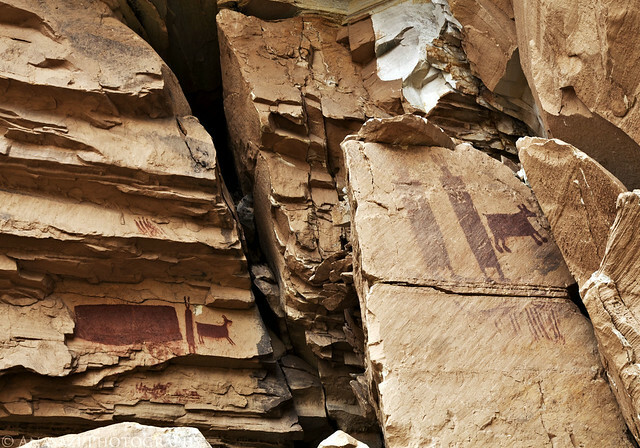 Along the way we continued to watch the canyon walls for signs of pictographs or petroglyphs. At one point the wash entered a small canyon where we couldn’t see the main canyon walls. Philippe decided he was going to climb up and take a look…at this point I had had enough climbing and decided to stay behind. A minute later he called for me…I almost didn’t go, but finally decided that I would make one final climb out. 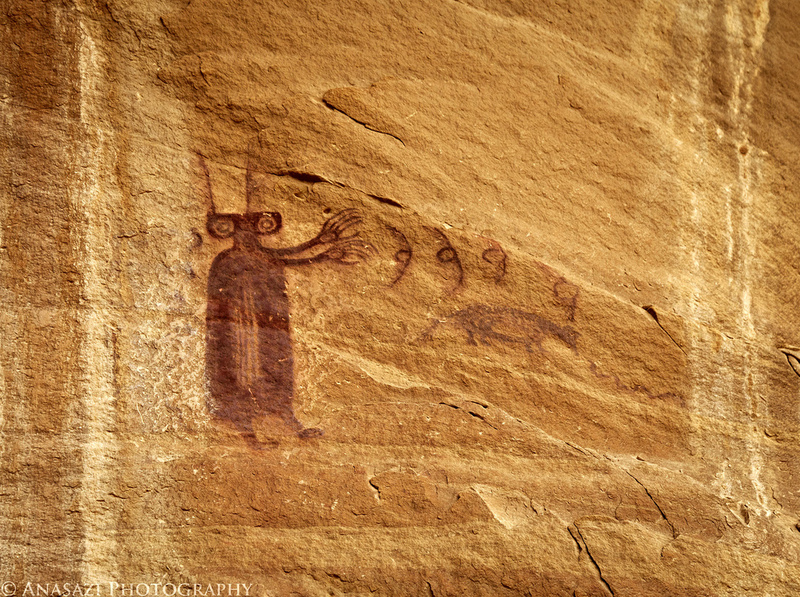 Once I reached the top of the smaller canyon I was pleasantly surprised to catch a glimpse of some Barrier Canyon Style pictographs that I was not familiar with. This was not one of the panels we had been searching for- it was something new. While photographing this site (I really wish I had brought my long lens with me…I guess I’ll have to go back and revisit this site again), I did take notice that there was no footpath leading to this site, which are common for most rock art sites. I also noticed that there were no other footprints anywhere to be found, except for ours, which made me realize this was a special find. I’ve decided to refer to this site The Unexpected Panel for two reasons. First, we were not searching for this panel- we were searching for other panels when we ‘unexpectedly’ came across this one. Second, because this panel consists of a few different regional styles all in one place which is very unique and also unexpected. Here’s an overview of the full panel that we found. The middle section of the panel has a few supplicant figures under a white arch. There’s a lot of detail found in this section. This is probably my favorite figure found at the site. The long fingers are very cool and the holes withing the hands reminds me of the Skeleton Shaman. It also looks a lot like E.T. 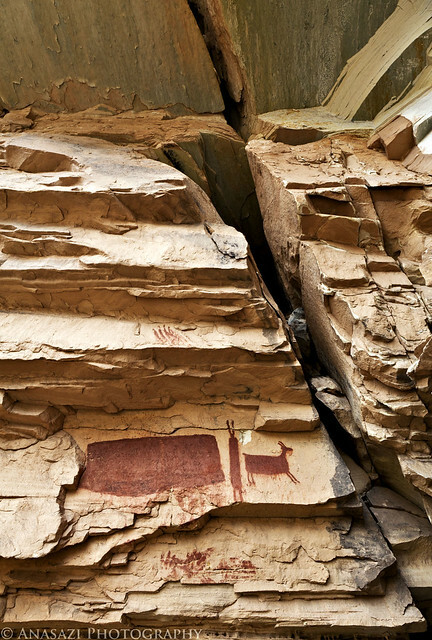 When I arrived home from this weekend trip, I contacted a few of my friends who know a lot more about rock art and sites than I do. I figured they would recognize this panel and tell me what it was called. What I found out is that none of them had ever seen it before. Not even David Sucec, who is part of the Barrier Canyon Style Project and who probably knows the location of more Barrier Canyon Style sites than anyone else. 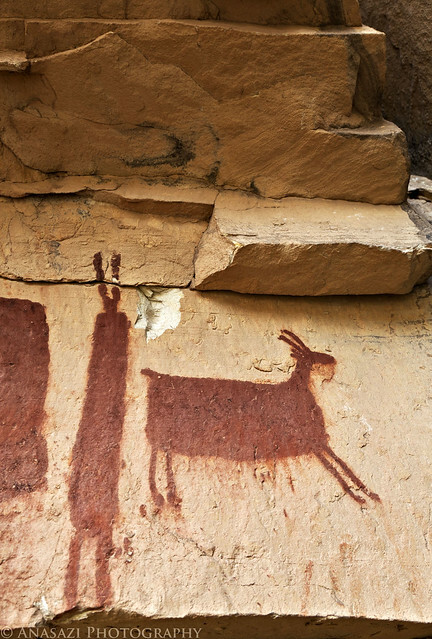 While I am sure that we are not the first people to come across this beautiful pictograph site, it is pretty cool to find out you have found something that very few people know about! Very nice pictures. 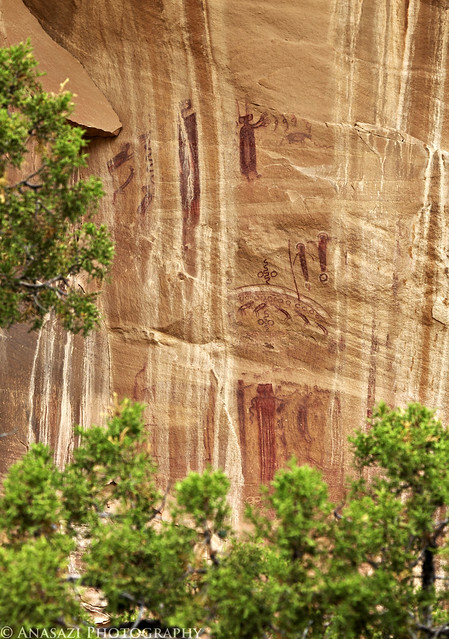 My wife and I would like to visit the site(s) when we are in Utah for the month of April (We are mid to late 70’s in age so not the type to destroy such art. Ourproblem is getting there. Can you give us map coordinates so we might see if a 4 wheel drive road will get us close for a modest hike? 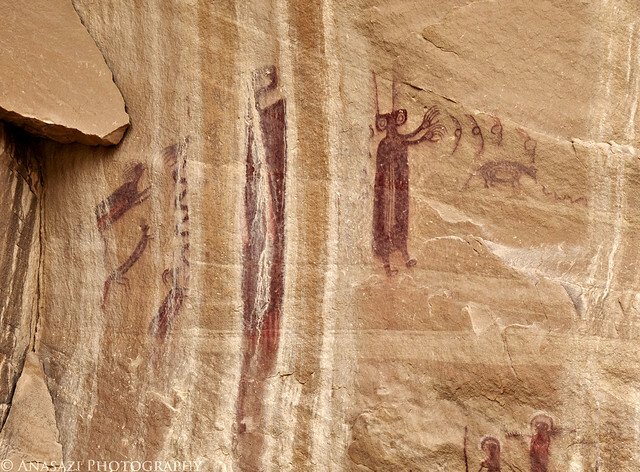 I’m sorry William, but I do not share locations of rock art & ruins with people I do not personally know. I can assure you that in order to reach this site requires a long and strenuous hike, though. There are no roads nearby. Thanks for your comment. I understand your philosophy. Thanks for not posting the location of this site. If people want to find it. They can work for it. It’s worth it. Why is it necessary for people to destroy something so beautiful? 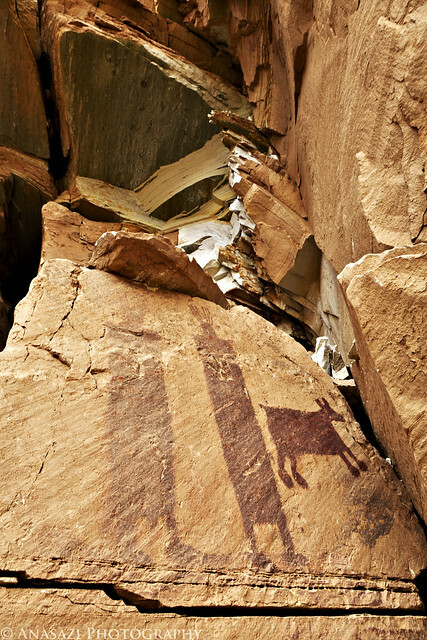 Remember that Ed Abbey’s opening chapter with his cup of coffee and the rattlesnake between his legs on his trailer porch still could say “I would rather kill a man than a rattlesnake [wilderness].” If only this could be true for those who mess with rock art. Realistically, what are the alternatives, we can protect them all.